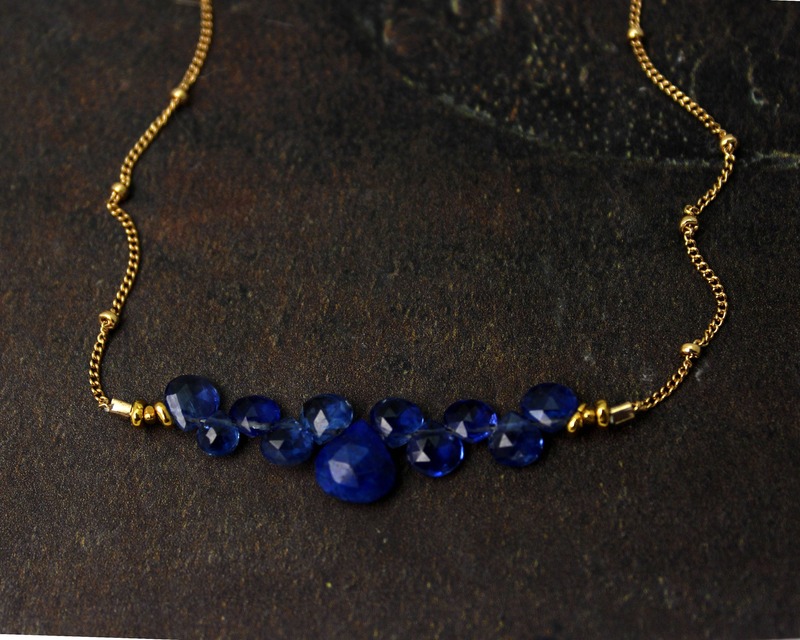 This listing is for the navy blue and gold bar necklace in lapis and fine kyanite. 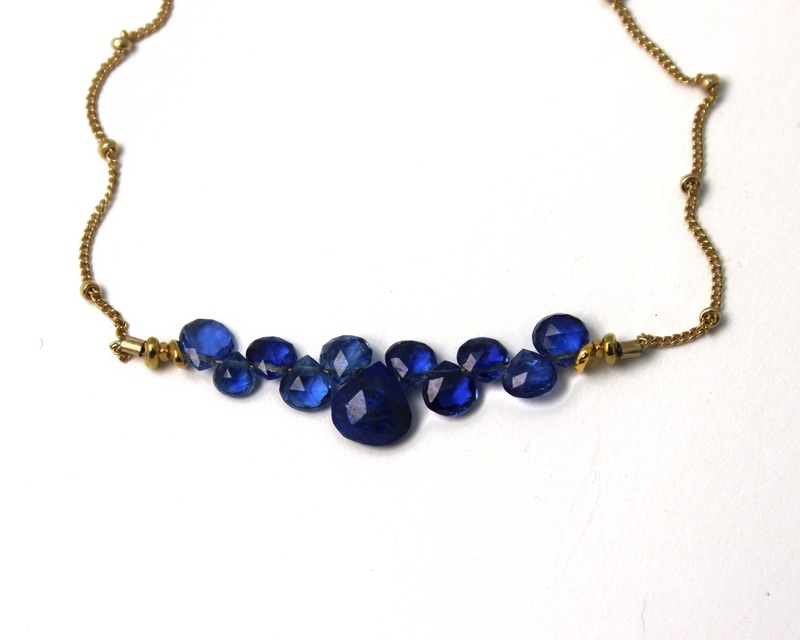 Made with natural gemstones and a delicate satellite chain. Let me know if you would like to use the color matching bridesmaid gift service at no extra cost, described below. I am happy to make each one the perfect length for each Bridesmaid. Just let me know in the notes at checkout. EXTENDERS AVAILABLE HERE - For adjust-ability! Discounts are given for multiple orders. Each one comes gift wrapped in a pretty box tied with a ribbon. I offer an optional wedding color matching service for your wedding jewelry at no extra cost. ** Just send me a picture or link which shows your wedding colors. 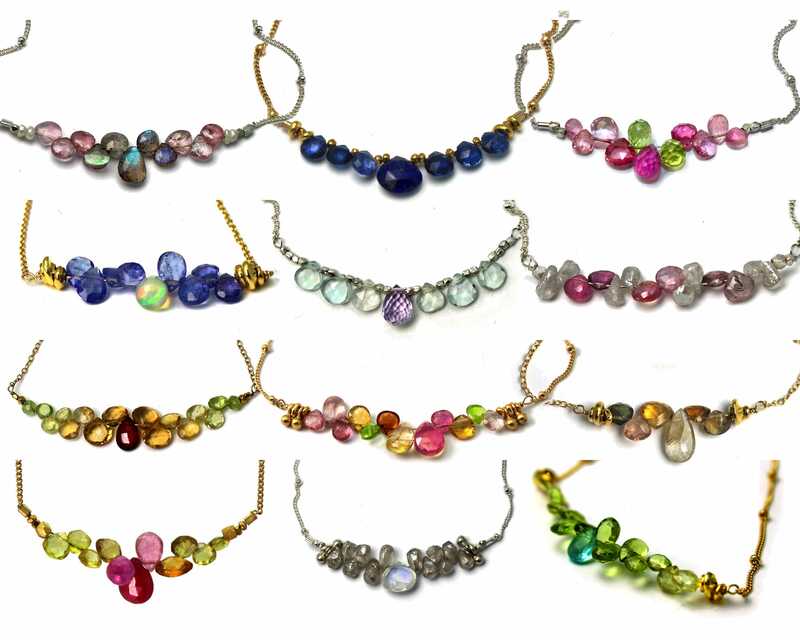 ** I'll send you a picture of the loose gemstones that I can use to make your necklace(s). ** I make, gift wrap and send as many necklaces as you need. Feel free to give me your own design ideas and gemstone preferences. I really enjoy making these! All chains and clasps are 14k Gold Filled or Sterling Silver. All charms are 22k Vermeil or Sterling Silver. Bezels and Wire Wrapped Gemstones are 18k Gold Vermeil or Sterling Silver. SO MANY PRECIOUS METALS. WHAT'S THE DIFFERENCE? VERMEIL is 925 Sterling Silver with a 1-2 micron plating of 18k - 24k gold on top. GOLD FILLED is an actual layer of gold, pressure bonded to another metal. Gold filled is not to be confused with gold plating, as filled literally has 100% more gold than gold plating. Gold filled is much more valuable and tarnish resistant. Gold filled jewelry is an economical alternative to solid gold! STERLING SILVER is 92.5% pure silver with some base metal for strength. FINE SILVER from the Thai Karen Hill Tribe is 97-99% pure silver, a little softer than sterling but very tarnish resistant. If you'll be ordering multiple gifts please request separate boxes during checkout.